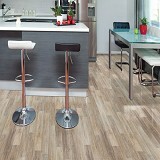 Save 30 to 60% on Harris Cork LVC Waterproof Flooring! Harris Cork LVC Waterproof Flooring - Sturdy low-thickness designs Available at American Carpet Wholesalers! By using a unique engineered multilayer WPC structure, with, the exclusive natural properties of cork, a higher standard in Luxury Vinyl flooring was achieved, providing the perfect match between beauty, comfort, and durability. Harris Cork flooring is manufactured for installation on any level, and over most subfloors. PRESS-FIT design interlocking Luxury Vinyl Planks can be floated, or glued down for a more permanent installation. Thin profile often allows for use over worn, unsightly floors without removing existing doors and trim. The uniqueness of LVP is achieved by integrating a prime quality core layer of cork, which provides superior comfort, noise reduction, and warmth. Environmentally sustainable, Natural Cork’s bark harvesting process is performed by craftsmen every nine years with hand axes never harming the tree prolonging the tree’s life often for more than 200 years. Buy today at American Carpet Wholesalers for 30-60% savings!